The best feng shui bedroom colors cover a wide range of hues. While each compass direction has an element that activates chi energy, each element has several assigned colors. Color alone cannot activate chi energy but it's a strong symbol that can be used to enhance your overall feng shui bedroom décor. This is especially helpful when searching for feng shui bedroom colors for couples. Colors, like the elements they represent, are either yin or yang chi energy. Yin is the female energy and yang is the male energy. The ideal is to create a balance between both energies. Some feng shui practitioners believe the bedroom should have more yin than yang energy to induce rest. Yin energy is considered nurturing, passive and loving while yang energy is energetic, aggressive and excited. 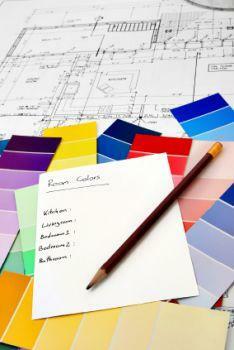 It helps to understand what properties go with each color to achieve an auspicious room design. That way, you can select colors based on the desired result you wish to achieve. Yang colors are vibrant and bright while yin colors are darker. The difference between yin and yang colors is easy to distinguish when you consider the yin (black) and yang (white) symbol. For a balanced chi energy, you want to offset bright walls with darker and contrasting colors and hues furnishing and vice versa for true auspicious room decors. Traditional feng shui works off of true compass directions whereas Black Hat feng shui used the bagua in a cookie cutter style of one size fits all. Classical feng shui relies on elements to activate chi energy while the Black Hat Sect adheres to the principle that color can be substituted for an element to either adjust or enhance the chi in your home. Black Hat sect feng shui practitioners believe that since colors are also found within the elements they represent, then colors must also contain element properties. The colors, however, are the same for each direction, regardless which school of feng shui you use. While the colors for directions are the same in both Black Hat and Classical feng shui, the application is very different. Black Hat feng shui places the bagua over a layout of your home. The bagua is placed the same on every home or business regardless of the home's compass direction. To use the bagua as a guide for your color choices, simply place the octagon-shaped bagua over the layout of your home with North side of the octagon over the front door entrance. It doesn't matter if your front door faces west, east or south; you still place the north side of the bagua on top of the front entrance of the layout. Traditional or Classical feng shui simply uses the actual compass sector your bedroom occupies. To determine this direction, you need to take a basic compass reading. Stand just outside your front door, hold the compass level, and note the direction. Draw a layout of your home and an overlay sheet for the compass. You want to draw a circle that extends beyond the size of your home. Use a drawing tissue paper for the compass direction overlay. Divide the circle into pie pieces. You need eight equal slices. Pencil in each direction, the same as a compass, N, NE, E, SE, S, SW, W, NW. Place the center of the tissue compass over the center of your home and turn as needed until you have the correct direction lined up with your front door entrance. You can now determine which compass sector your bedroom occupies. For example, if your bedroom is in the west sector of your home, then you want to use the color palette assigned to the west direction. Visual aids often help to fix theories in your mind. You've probably seen feng shui color charts that limit you to only one color per direction. This can make for a monochromatic room if you only use various hues of a single color. There are other colors that aren't always included in charts for various reasons. In Black Hat sect, the bagua is used differently. Instead of applying Compass or Form and Shape principles with the bagua, Black Hat feng shui uses the bagua as a blueprint for all homes and buildings. Below is a chart that you can use for a quick reference to your bedroom's direction, color, and element. It is the same for all schools of feng shui. A master bedroom serves two purposes. One is for romance and the other is for rest. A couple may prefer to have more yang energy. You can create this cozy respite with yang colors, such as red, pink, peach with a balance of darker colors (yin). The purpose of this bedroom differs from a guest room where you may wish to promote a very restive for those visiting you. In fact, you may opt to go with an imbalance of chi so that the room has more yin than yang energy. The focus for a master bedroom should have a healthy balance of yin and yang energy. However, that same amount of yang energy wouldn't be appropriate for a child's that should be considerably less. Children typically have high energy (yang), so their bedroom should offer an engaging chi energy tempered with yin energy to promote a restive area, especially for younger children. Where a master bedroom might feature bright yang colors, a child's bedroom would use a pale value of that yang color and contrasted with darker colors (yin). 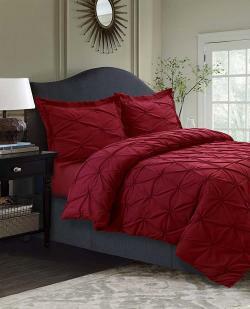 You can use feng shui for selecting the best bedding colors. By using the colors assigned to each sector, you can choose the most auspicious colors for your bedding. Take advantage of the above chart and select sheets and comforters within the color ranges according to the bagua chart you superimposed over your home layout. Selecting the ideal color(s) for your bedroom is key to creating a room that is enjoyable and nurturing after a long day. Your bedroom is your haven and should be a place of fun and rest. You want to implement other feng shui principles in your overall bedroom design to ensure you have the best bed placement and use the correct elements to activate auspicious chi energy.